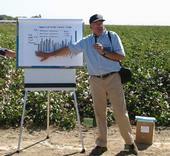 Brian Marsh is the director of UC Cooperative Extension in Kern County and an agronomy farm advisor. Brian Marsh, the director of UC Cooperative Extension in Kern County, talked about the upcoming UCCE centennial celebration with host Scott Cox on First Look, a web video and radio program that provides Kern County resident with an overview of the day's news. The program is broadcast on the Bakersfield Californian webpage and on KERN radio. 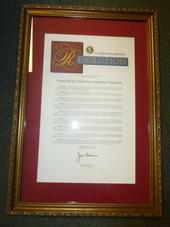 California State Sen. Jim Nielsen presented a senate resolution to the staff of UC Cooperative Extension in Tehama County last week to commemorate the organization's 100th anniversary, reported the Red Bluff Daily News. He also spent several hours discussing current challenges and changes facing California agriculture. The article detailed the comments shared by the UCCE staff. 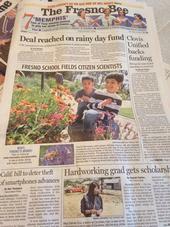 Front page of the Fresno Bee on May 9, 2014. UC Cooperative Extension yesterday celebrated the 100th anniversary of the Smith-Lever Act, the law passed in 1914 that created an organization to connect the gap between university research and people who can put it to use. A key part of the celebration was a Day of Science and Service, UC's largest-ever citizen science project. An ag tour with county agricultural agent J.W. Logan, DVM, in 1928. A series of "Let's Get Local' farm tours are running from now till Oct. 12 to mark the centennial of UC Cooperative Extension in Humboldt County, reported the North Coast Journal. Stories about the tours also appeared in the Times-Standard and the Redwood Times.